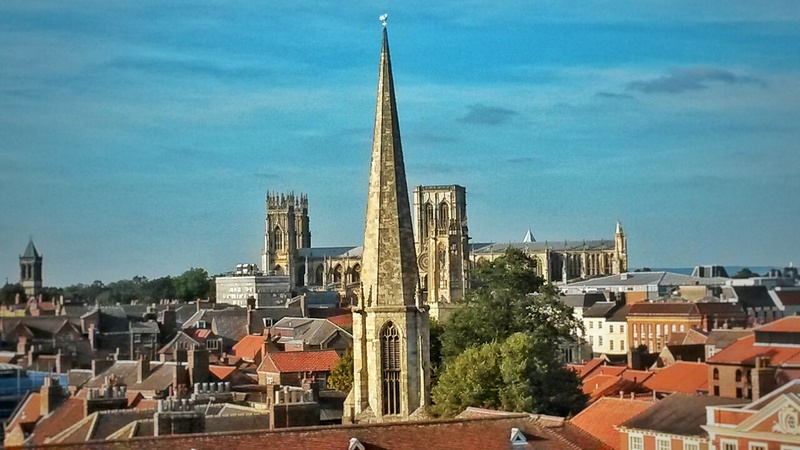 4 Hours in York, A Picturesque Medieval City in England – Why Waste Annual Leave? 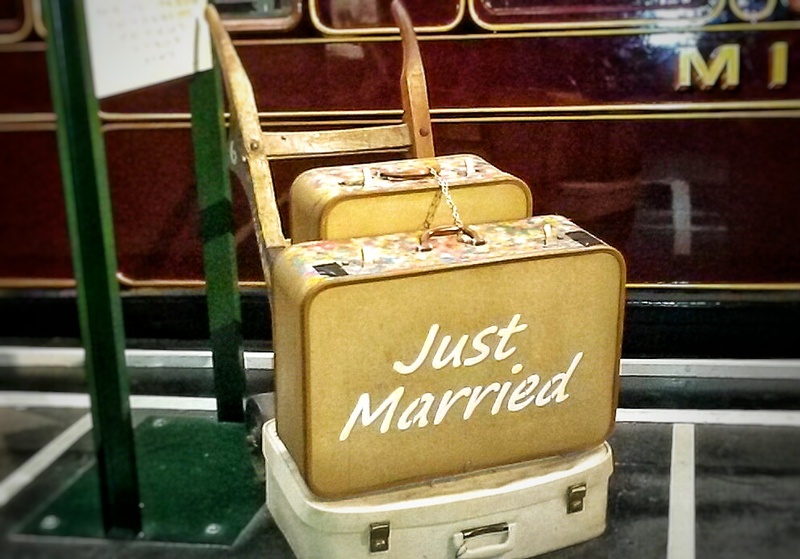 Since I started blogging, my sources of travel information have considerably changed. Whilst I won’t deny that the ripe old Lonely Planet and the gravitational Trip Advisor still play a role in many of my travel exploits, I now gain much greater pleasure from those nuggets of wisdom shared by all of you. Some of your “48 hours in…” guides have all but done my entire holiday research for me and so many of you have honed down the skill of hopping around a new city in just one day. But sometimes, we don’t have 48 hours, we don’t have one day, we perhaps don’t even have half a day. I rarely see blog posts covering how to see a place in just a few hours but our trip to York last month was sandwiched between a morning in Durham and a final arrival destination of our comfy new mattress in London so we got our efficiency hats on and made the best of our 4 hours in York. 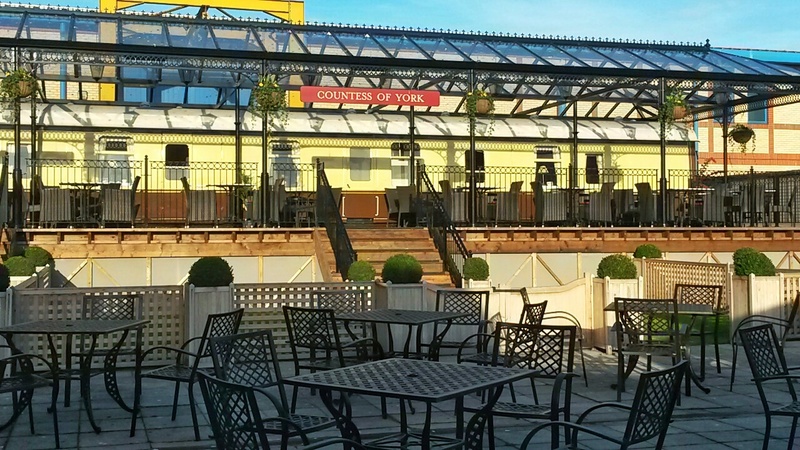 If you find yourself in the same boat with only an afternoon to spare there, I hope this whistle-stop tour around the quaint medieval city of York might prove helpful. 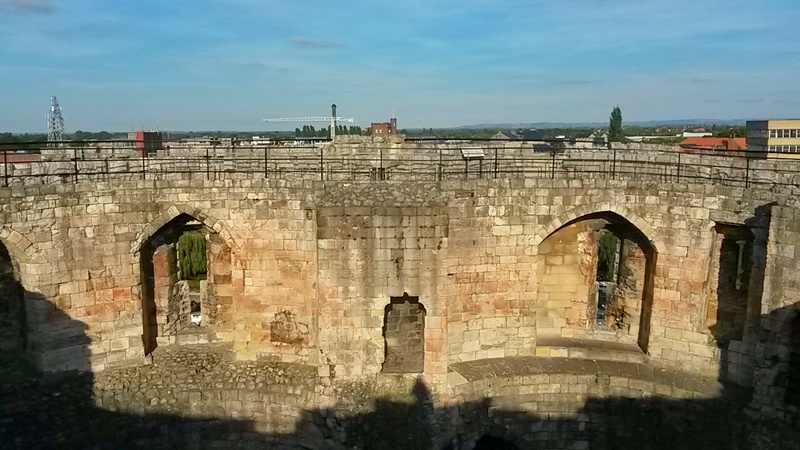 If you have climbed the Coliseum in Rome or the Duomo in Florence, the handful of steps at Clifford’s Tower will seem easy in comparison. 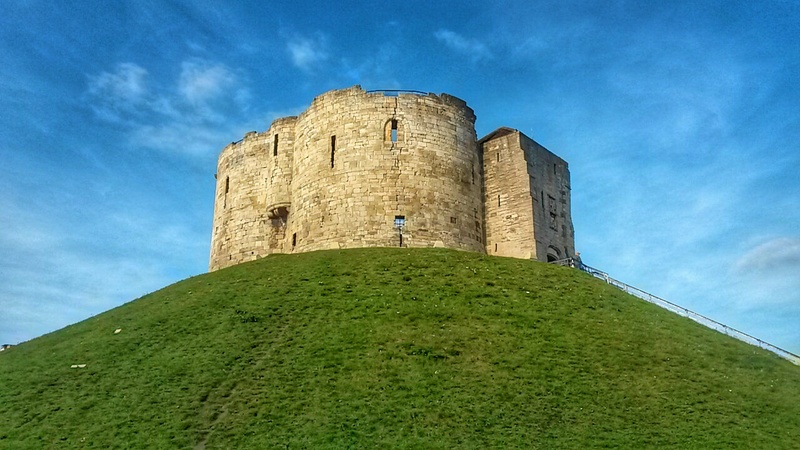 Like most ancient forts and castles, the staircases are not suitable for claustrophobes but fortunately, you don’t have to conquer too many of them before you reach the vantage point at the top, which offers panoramic views across York. There is a small fee for climbing the tower but if the weather is on your side, it is certainly worth the ascent. 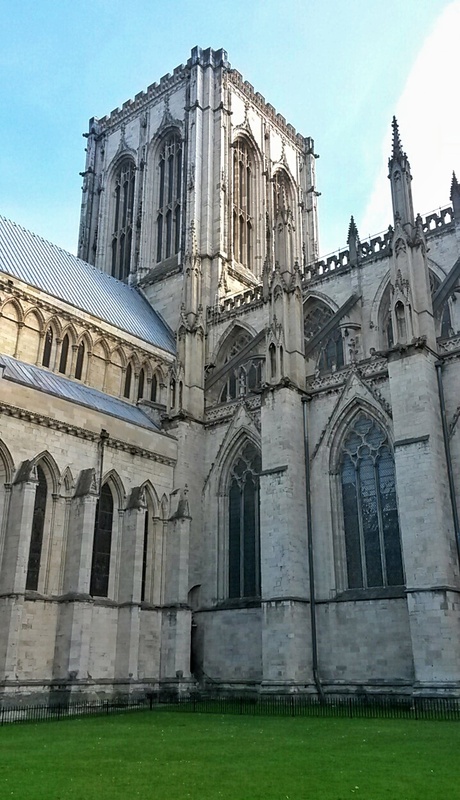 Some would say the famous York Minster Cathedral is by far the most popular and renowned attraction in the city. I must confess that whilst we gawked in awe at the Gothic exteriors, we ultimately ended up opting out of exploring the inside. 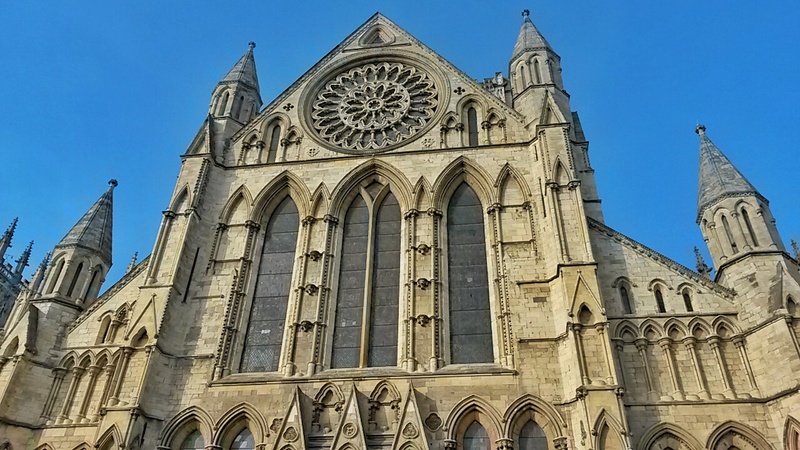 We had already spent the morning browsing Durham Cathedral and we knew we would only have enough time to either see the interior of York Minster or a museum we had our eye on (read on to find out which one) so something had to give. 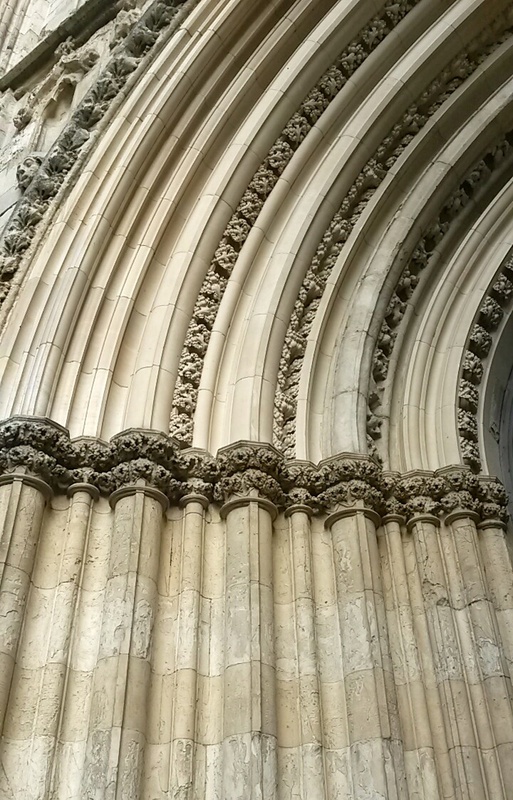 The entry ticket for visiting the York Minster is on the more costly end of the spectrum at £15 per adult (find the price list here) but given that the maintenance of the property can cost thousands of pounds daily, the money does go towards upkeep of this stunning building. I am told by all those who have been before me that the interiors are spectacular and although we had a little glimpse from the entrance, I would definitely take a proper look inside if I ever return to York. 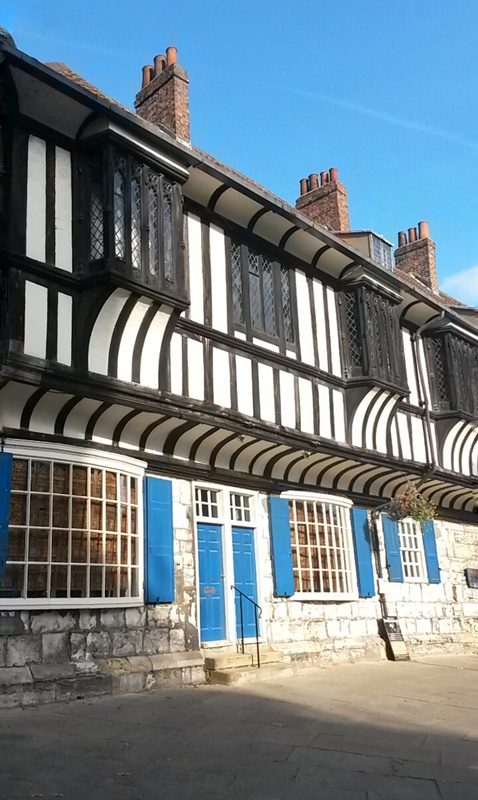 I love the fact that York is home to a street whose crooked and uneven imperfection has resulted in its perfectly quaint cult status. 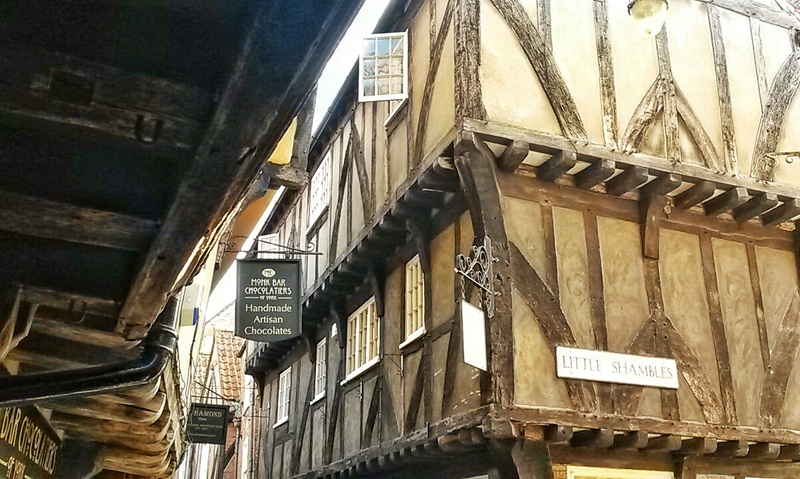 The Shambles is consistently name-checked as one of Britain’s prettiest streets with the fifteenth century buildings on either side of the road leaning in flirtatiously, the rooves so close they are virtually caressing each other. 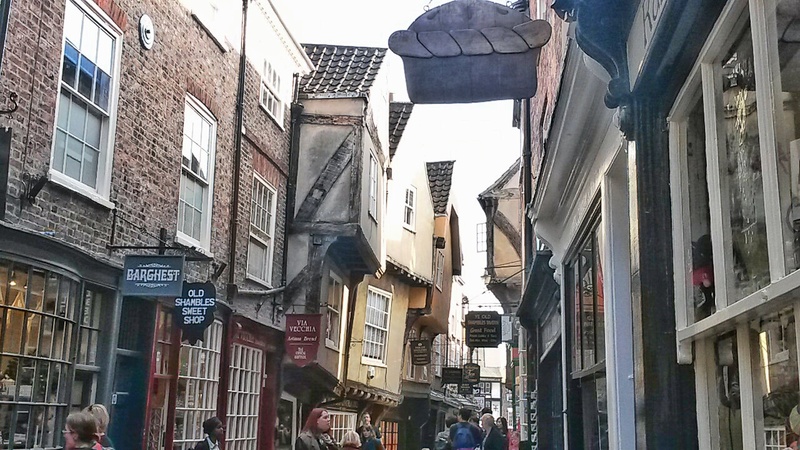 Of all the places in York we visited, the Shambles easily had the most dense proportion of keen photographers and given its well-preserved Medieval charm, it was not hard to see why. If you can peel your eyes away from the architecture and the retro signs, spend a few moments browsing in and out of the independent shops, quirky, endearing tea rooms and watch your will power crumble away when the aroma of the freshly made fudge consumes the pores of this narrow street. I introduced this post by saying how much I enjoy hearing pearls of travel wisdom from fellow bloggers and it was thanks to Adventures of a London Kiwi that I was given this particular tip-off. I was snugly under the duvet in a cosy Durham pub hotel, when she spotted one of my tweets and told me that I must not miss out on a visit to Fudge Kitchen in York (the chocolate orange flavour is a bit heavenly) but I saw and raised by also visiting the newer Roly s Fudge Parlour, where we stepped in just as a new batch of fudge was being made. 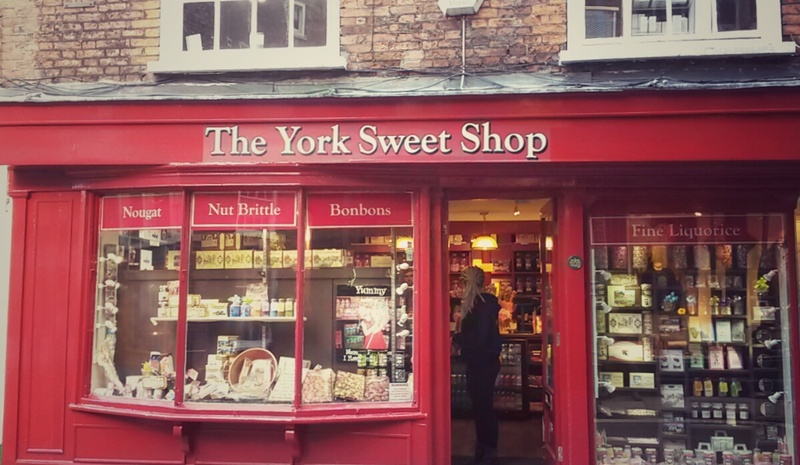 If you have more time than we did and the fudge shops haven’t quite curbed your sugar cravings, then either experience the quaint magic of an old-fashioned English sweet shop or make your way over to York Chocolate Story for a decadent hot chocolate in the chocolate bar cafe or a guided tour of the chocolate factory and find out just why York is such a significant place when tracing the history of chocolate in the UK. 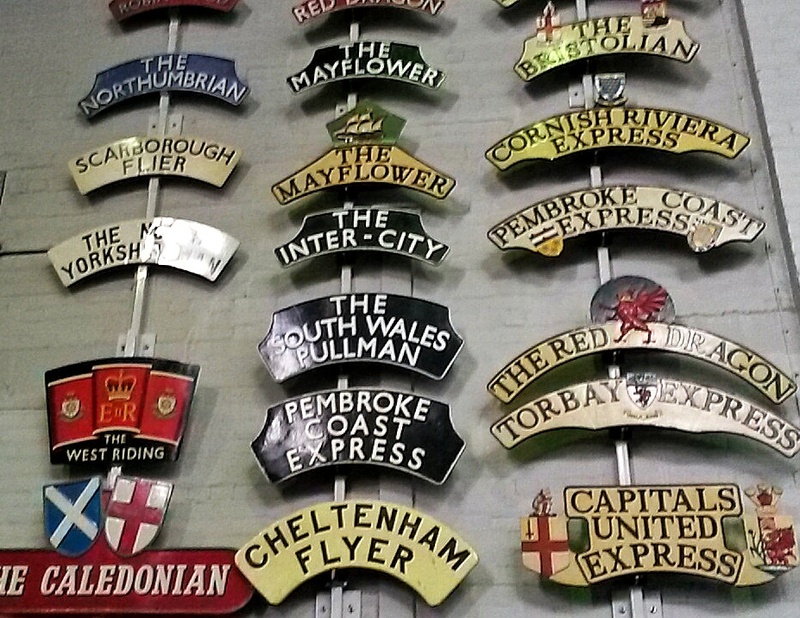 Full of genuine old trains in a huge open space, we saw everything from royal trains to old steam trains to parcel delivery trains. 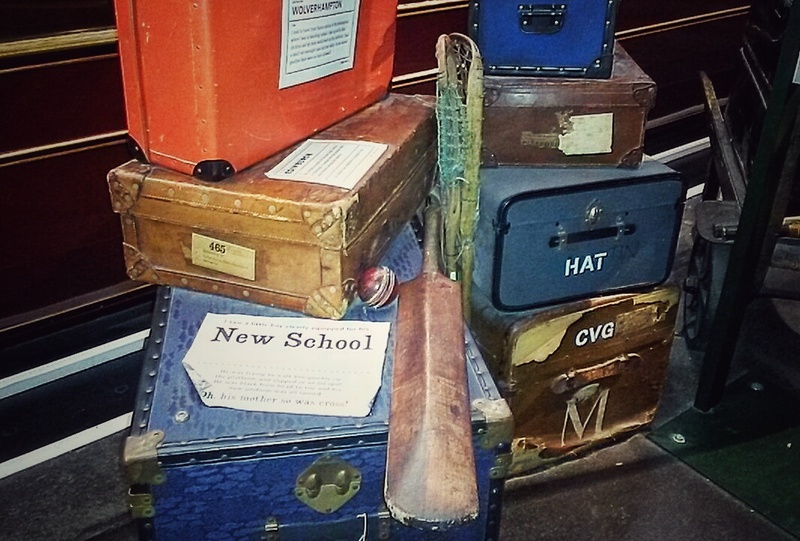 And we even saw some of the old parcels they were carrying. 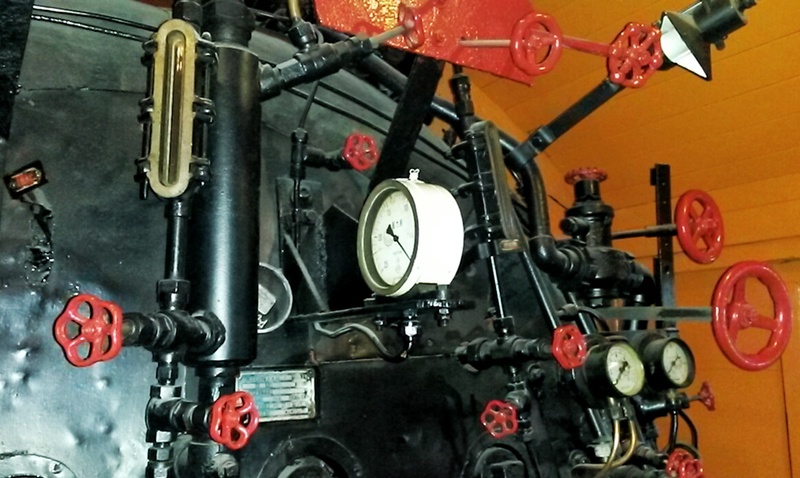 We had fun climbing into some of them and getting a taste to what it must have been like to get on board these trains at a time when they were considered such innovative, exciting scientific accomplishments. And as two Londoners who have spent far too much of their collective time standing on crowded London trains, it was nice to have a whole carriage to yourself and to actually get a seat! The museum even has its own dining car restaurant but as we had arrived so late in the day, they were setting up for a private event. 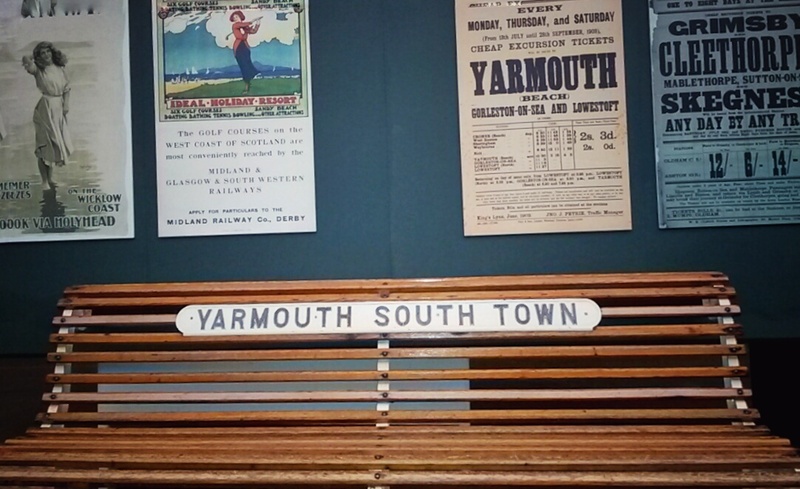 And we became nostalgic and patriotic when looking at old signs that used to be found at train stations, Pumpkin taking a particular shining to the Yarmouth memorabilia, a part of the country that conjures up so many nostalgic, childhood memories for him. 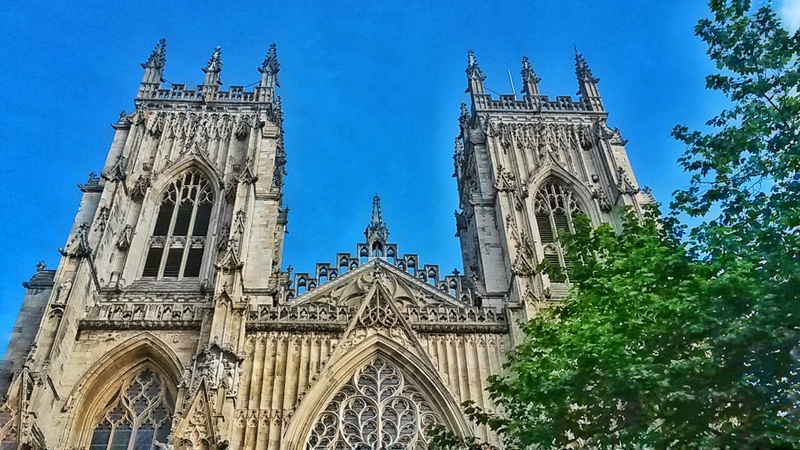 Whilst I would have loved to have spent another day or night in York, hopefully this post has proved how many of its highlights you can capture even if you fancy an afternoon out in this beautiful medieval city. Have you ever visited York? What would you add to this list? 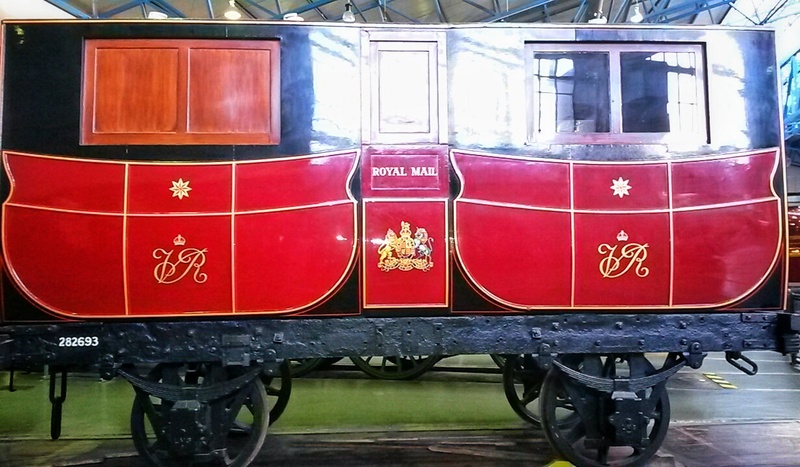 You went to the railway museum! Hoorah! I flippin’ love it! I’ve been to it a couple of times now, hahaha! Sounds like you really packed a lot into those four hours, very impressive! Oh my goodness, isn’t it just the best museum?! I’m not even a huge museum person normally but we had so much fun here! I only wish we’d had a bit longer to walk around it a bit more slowly but I can totally see why you’ve been a few times, it’s fascinating! Yes! The architecture there was stopping me in my tracks the whole afternoon Katie, so beautiful! Only 4 hours!? You packed in a whirlwind tour of activity, that’s for sure! Haha, we did a LOT of walking during those 4 hours Emma! I’d loved to have spent a bit longer up there but as it was mainly a trip to the North East of England, this was a little add on bonus before we got back to London 🙂 Thanks again for the fudge shop tip! I loved York, visiting the Minster and walking around the walls but I never got to Clifford’s Tower, I think a return is long overdue! And I didn’t make it inside the Minster, which I’m definitely going to do if I return myself Suze! A really pretty city. Very impressed how much you fit into four hours! 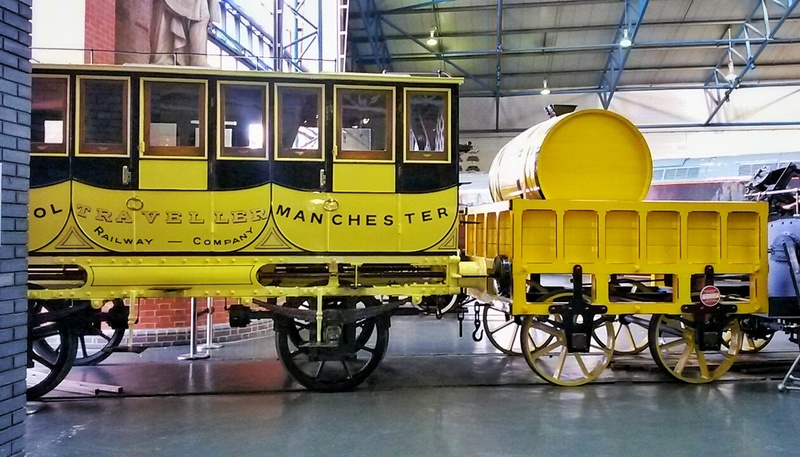 Love York – I’ve got a weekend guide in the drafts folder with a lot of the same places, the Railway Museum is great and I love the Castle Museum too, such a random mix of exhibits. Oh I’m very much looking forward to seeing your York post too Lucy! 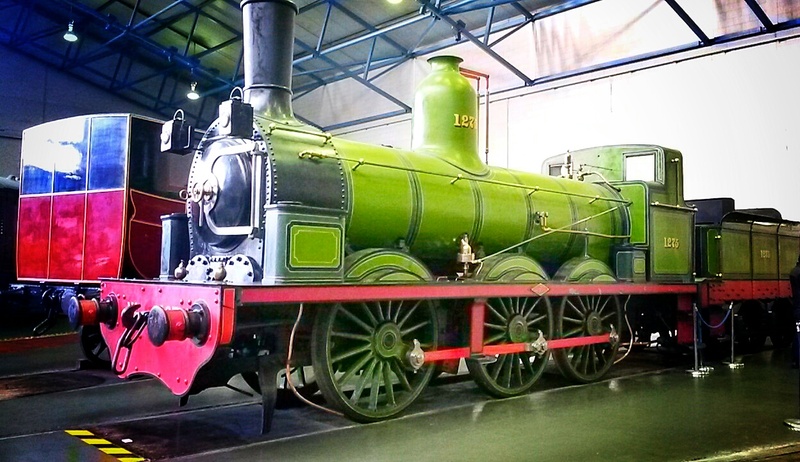 I didn’t expect I’d enjoy the railway museum so much but it was a tip from someone and I absolutely loved it! I could have done with another night or two in York but have a few ideas of things I want to explore next time I go there. It was such good fun Andy! 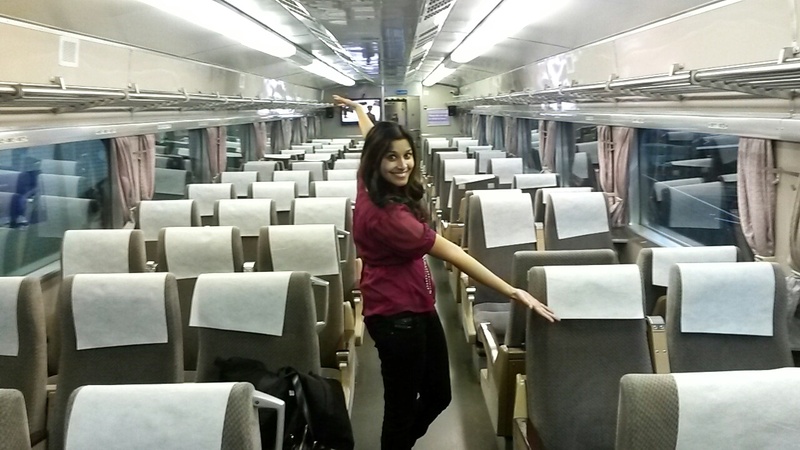 Definitely brought out the train-loving geek in me! I can’t believe how much you managed to squeeze into just 4 hours! Wish I had this guide last year when I was in York. I had a few hours to kill in the city before coming home from my friend’s hen do, and I honestly didn’t do half of what I wanted to do (although, to be fair, the hangover may have had something to do with that…). I love York, so pretty and so many interesting things to do! I agree Becky, such a beautiful city with a surprising number of great activities and sights as you say. 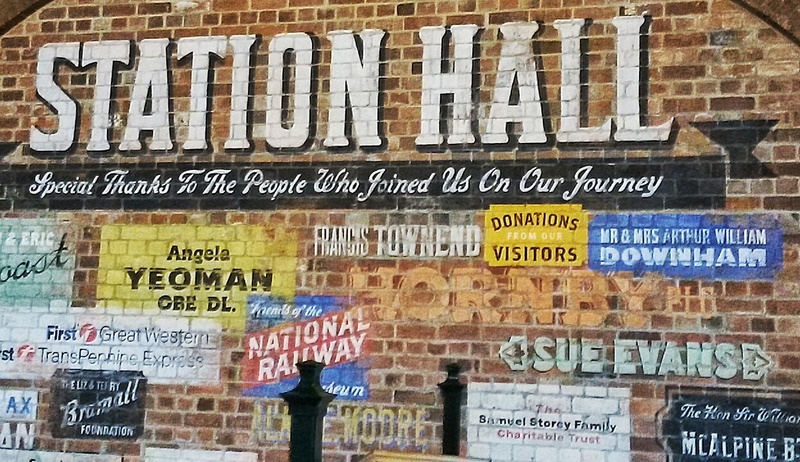 Only 4 hours, but you can do a lot of different things in York. Eat Gourmet Fudge and Chocolate? That is something Cez would love to do, I bet! So glad you managed to pack so much in to four hours! 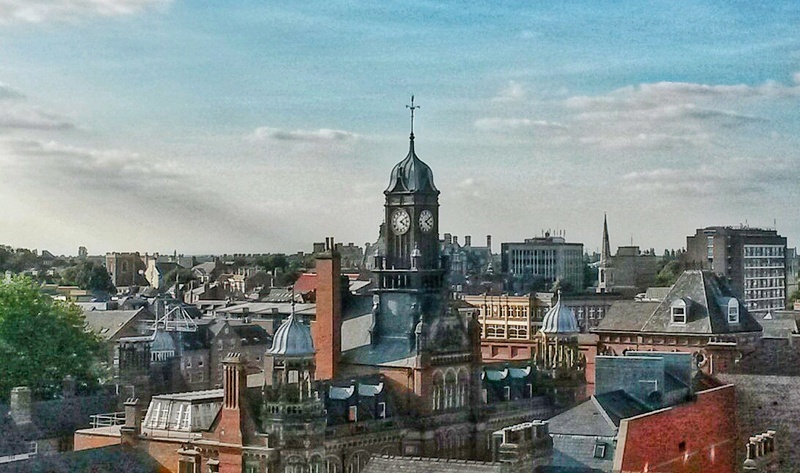 I grew up in Scarborough, so York was our closest city and I absolutely love it. York Minster is lovely inside and, if you ever get a chance to go back, a good tip is to go to one of the services as a) it’s then free to get in and b) there’s something quite magical about sitting in it when it’s full, especially at Christmas or Easter. Betty’s tearoom is also a must! Ah, thanks so much for the tips Emily! I wanted to go to Betty’s actually but because I had been to the one in Harrogate before, we ended up picking a different tea room in the end. I haven’t even mentioned on here that we stopped to sit down for a scone! I’ll definitely remember that about the services, must be really magical at Christmas time! We agree, TripAdvisor and the traditional guide books are great starts for researching a trip, but then to delve deeper, good travel blog posts are very helpful. 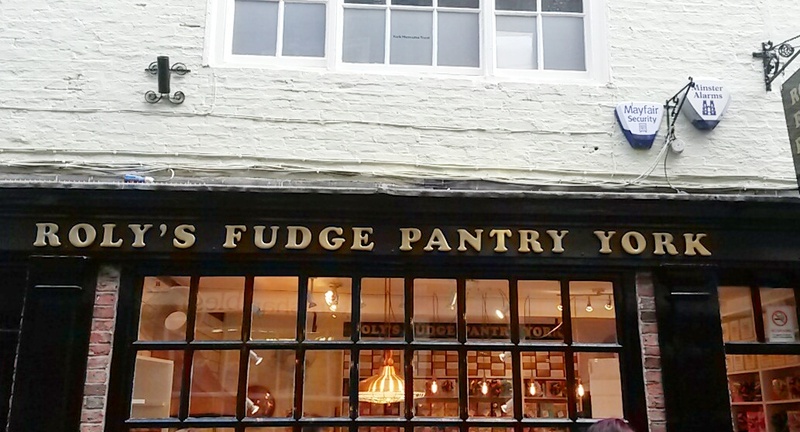 The Shambles looks like a pretty place to roam – and the fudge looks dangerous :-). Being named one of Britain’s “prettiest streets” must attract competitors. In Majorca, Fornalutx (which we walked to from Soller) is named as the island’s “prettiest town” (and some say Spain’s “prettiest town”) but we found other strong contenders for that title, like the quaint village of Deia (where there’s so little flat land, people are buried standing up). A very interesting read. Of Course York is beautiful and I would love to do 24H and see how much I can do. Great pics. Thanks so much for the kind comment Marc! I agree York is so beautiful – ideally we’d have spent a bit longer there too but it was just a short stop en route back to London so I’d love to return there and go for a few days next time. Oh it’s so pretty Ayla – you should definitely put it on the list for your next staycation but if you do get a bit more time than we did, I highly recommend it as there’s quite a lot to do in York and it’s nice to be able to take it in at a less athletic pace than we did! York looks so pretty! And how cute is The Shambles? Looks like something out of Harry Potter! Rather embarrassingly Laura, I’ve never actually seen Harry Potter (!) so I’ll have to take your word for it on that front but yes, the Shambles is SO cute! 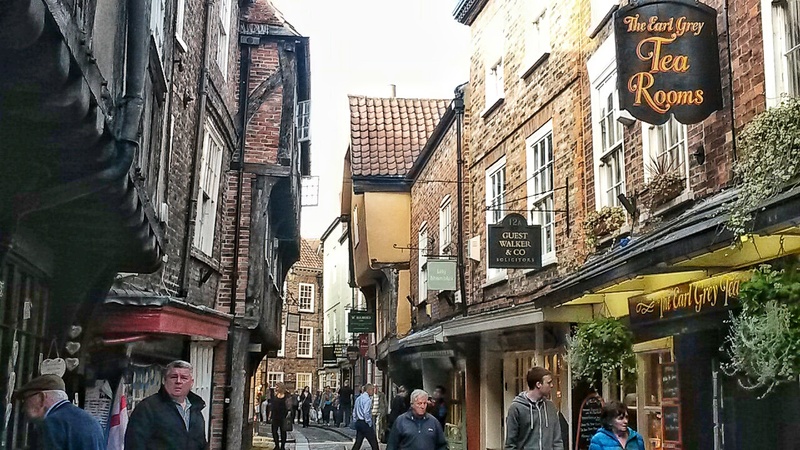 Actually, York in general is pretty darn charming, so photogenic and historical. It’s quite touristy but that doesn’t seem to spoil it and I loved it there, definitely worth a visit if you get a chance and haven’t been before! I loved York and I think you managed to fit more into 4 hours than I did in a whole weekend there! Might have been a pub crawl that took up a lot of my weekend though… Would you recommend Durham? It’s been on my list for awhile. 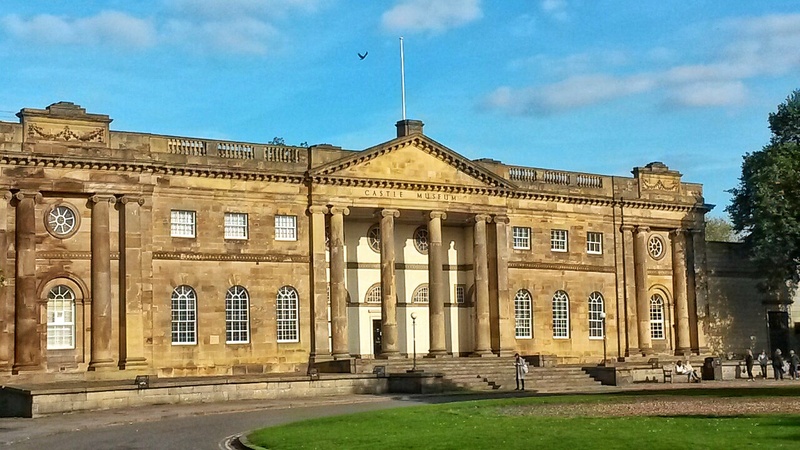 Pingback: Highlights from Northumberland and Durham, North East England | Why Waste Annual Leave? Oh, I have to visit it some day! Yes, I would definitely recommend it – it is touristy but with good reason but if possible, better to allow yourself more than just one afternoon!